I recently launched a new blog series, Makerspaces A to Z. You can read all about the letter A here and B here. Thank you to all those who shared their thoughts about this post to the #MakerspacesAtoZ hashtag. Thank you also to those who shared their thoughts about letter C words there, as well. SO many wonderful possbilities for the Letter C! Letter C for me, represents Combinatory. Although many educators are interested in progressive ideas such as Makerspaces, STEM Labs, Project-Based Learning, Inquiry-Based Learning, and Genius Hour, many are left feeling unsure of how to integrate all of those things into their practice, and oftentimes feel they have to pick between these things, mostly due to time constraints. I define a makerspace as a unique learning environment that encourages tinkering, play, and open-ended exploration for all. When planning and creating a makerspace, I think many focus on what to buy for their space, and lose site of the fact that really what they are creating is a unique learning environment. If we think of makerspaces in terms of a learning environment, it can be a physical laboratory in which all of those progressive ideas can exist. There will be times in which you will pull in elements of STEM Labs, Project-Based Learning, Inquiry-based Learning, and Genius Hour, into your makerspaces, combining and recombining characteristics and principles of all of these things, morphing our spaces into something new and unique, when we do so. This notion is not new. I have long since been fascinated with the idea of combinatory play (and even include some combinatory play activities in my makerspace professional sessions for educators). Combinatory play is what Einstein called putting unrelated thoughts, topics, images, and ways of thinking together to generate new concepts. It allows you to find connections between randomly selected objects, words, pictures, ideas, etc in turn creating new, fun, innovative concepts and ideas. 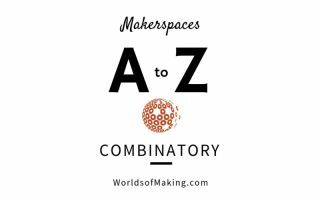 Combinatory has become an essential feature in makerspaces.